In Reading, we finished “Yonder Mountain” and started a new story called “The Extra Good Sunday.” In this story, two characters named Ramona and Beezus complain about their dinner one night. Mom and Dad respond by challenging their children to make dinner for them. Panic ensues as Ramona and Beezus scramble to put something edible together for their parents. We talked in detail about plot and character motivation, discussing why the parents responded the way they did, and how Ramona and Beezus handled their challenge. In Science, we moved from space exploration into matter, discussing the three types of matter and how they go through changes. An important talking point was the distinction between physical and chemical. While physical changes involve an alteration in shape or size, chemical changes usually include signs of burning, rusting, or even exploding. Together we looked at scenarios of different types of matter going through changes, and how they could be sorted into their own appropriate categories. In Social Studies, we focused on culture in a community. We talked about the different aspects of culture — language, tradition, custom, art — and the way they are demonstrated in places like Taiwan or the U.S. As a project, we made our own interpretations of Australian Dot Art. Students got to pick an animal native to Australia and speckle colorful dots around them in creative patterns. This was to honor the culture of the Aborigines, who were the first to settle in the territory. In Grammar, we moved past punctuation into subject and object pronouns. Through various exercises, students learned to identify subject and object pronouns in a sentence, as well as replace nouns in a sentence with their own corresponding pronouns. It is a common mistake for students to use ‘he’ or ‘she’ as the object of a sentence — as opposed to ‘him’ or ‘her’ — and these lessons have helped to correct such habits. 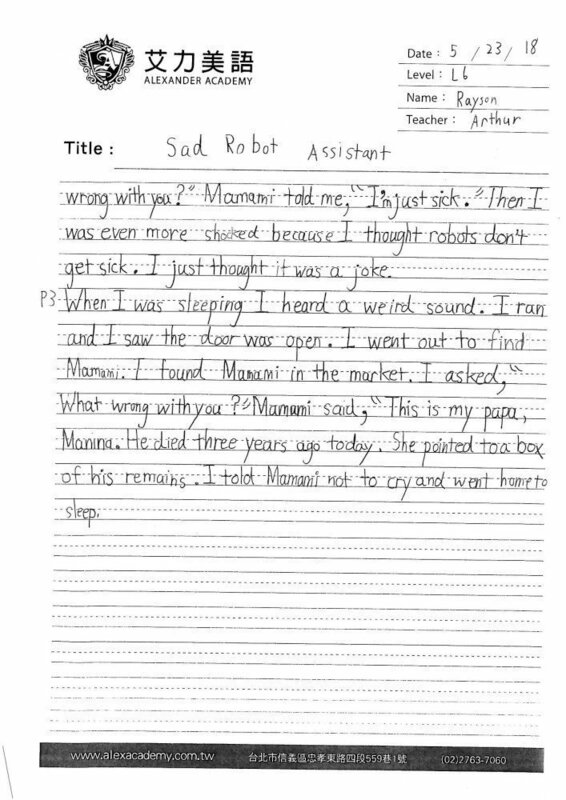 In Writing, we started a new writing project called “Sad Robot Assistant.” Continuing the trend of creative writing, students were asked to imagine a future in which everyone has a robot assistant. While everyone’s seems to be working just fine, you come home from school one day to your robot assistant sobbing in your bedroom. What is the cause for your robot’s sadness, and more importantly, how do you react when you find out your robot has feelings? Overall, the students have been maintaining a positive attitude and giving their best efforts throughout our classes. I’m extremely proud of them and I look forward to continued success in June.